The cruise card is the must-have souvenir of its time. These simple plastic cards unlock many fond memories. But their future is at risk from wearable technology that could help cruise lines deliver unparalleled luxury service to the masses. In the tech world, wearable gadgetry is the here and now. Popular wrist-based devices such as the Fitbit and the Apple Watch have revolutionised this market. Smartwatches and fitness trackers lead the pack as smart glasses fall by the wayside. Designers are experimenting with embedding devices into clothes and jewellery to create dual-purpose, personalised, beautiful, and functional products. Royal Caribbean was the first cruise line to make use of wearable technology. It's WOW Bands were heralded as the future when they launched alongside Quantum of the Seas back in 2014. 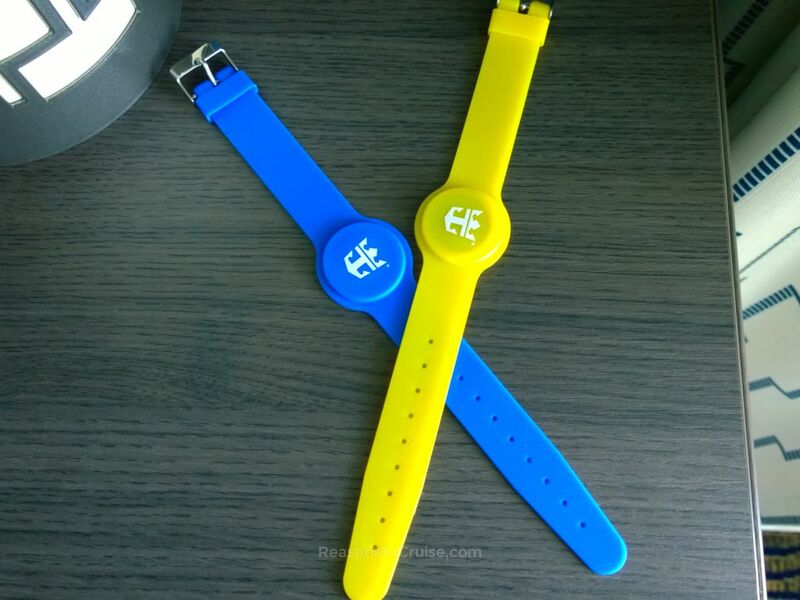 The silicone watch-like device is available in red, black, yellow, and blue. It contains a RFID (Radio Frequency Identification) chip that contains the same information as the plastic SeaPass card it threatens. At its launch, it looked like it was a cruise card killer. That was until late 2015 when the cruise line started charging $4.99 (&thickapprox; £4) per device (suite guests can receive free bands). Nothing puts the brakes on change as much as an additional charge. While it was a good start, I could not get to grips with my WOWband on Anthem of the Seas. The device relied upon direct contact with the RFID sensors embedded in the cabin doors or the tills at the bars and shops. I can see the appeal for children or new cruisers who have yet to start their collection of cabin cards. But I found the WOWband too much hard work compared to the plastic SeaPass card, and I ditched it within a couple of hours. One positive aspect from the introduction of this technology is the RFID chip that has made its way into the plastic SeaPass cards. Suddenly, SeaPass cards became smarter. No longer did they need swiping. They just needed touching against a receiver. When MSC Cruises revealed details about MSC Meraviglia and MSC Seaside, it also announced its plans for a technological revolution. Instead of RFID, the cruise line has invested in NFC (Near Field Communications) technology. Theoretically, any NFC-enabled device could replace the cabin card. Many smartphones, for example, have NFC capabilities, so opening your cabin door or paying for a drink with your phone could become a reality. Dubbed MSC For Me, passengers are issued wristbands with NFC technology embedded in them. Early images show red and blue silicone wristbands, which is disappointing for a fashionable Italian cruise line. The bracelets can be used to unlock cabin doors, make payments onboard, and to book restaurants and shows. Taking the technology further, MSC Cruises reckons the technology will help parent geolocate their children onboard using its app and 3,050 Bluetooth Beacons around the vessel. Here, we stray from a purely transactional concept into one that adds safety and reassurance. Lastly, take a step into virtual reality as MSC Cruises wants to show you immersive virtual shore excursions before you buy the real things. In 2017, Carnival Corporation launched its line of wearable technology. Known as "Ocean Medallion", this stylish disk pushes the boundaries of what a wearable device looks like and what its capabilities are. Inside each Ocean Medallion is an array of communication technology, including NFC and Bluetooth Low Energy (BLE). The discs themselves are passive - there's no on/off switch and no batteries to charge. It will be laser-etched with the passenger's name, ship, and sail date. Best of all, it will be provided free of charge, just like the current plastic cabin card. The device pairs with an app and seeks to provide a more bespoke holiday concept. Carnival wants more of its customers to pre-plan their holiday using the app, with the promise of a "more personalised experience". Your preferences will beam to the ship and its crew, and you will receive suggestions and invitations for the things you like. The app can also be used to track Ocean Medallions so keeping tabs on your children will be easier. Carnival recognises that there will be demand for different styles of housing for the Ocean Medallion, and so its shops will be equipped with various holders in a range of styles. Expect to see a range of jewellery, clips, key chains, and silicone bands. But here is the clever bit. The Ocean Medallion is location aware. Order a drink through the app, and it will be delivered to you wherever you move to on the ship. Order a drink in your cabin, head to the theatre, and the waiter will find you at your seat. This intuitive use of data is an example where technology genuinely offers more freedom and flexibility. Ocean Medallion will be first added to Regal Princess in November 2017, with roll-out fleet-wide over subsequent years. Change is often difficult to push through, and the move from plastic cabin cards to wearable devices will be no different. Royal Caribbean began the revolution, but other cruise lines are muscling in with their offerings. And with each incarnation, the possibilities and potential benefits expand. For any technology to be a success, it needs to provide value without being creepy. Smart technology generates masses of personal data - where we go, what we do, who we do it with, etc. Cruise lines have a lot to gain from this data, but they have to convince the masses that the loss of data privacy is both justifiable and worthwhile. Using devices to unlock cabin doors and to pay for shopping is one thing, but being able to offer bespoke luxury service to the masses is the biggest step change so far. By making the devices stylish too, wearable technology can become a fashion statement in its own right too. Will this type of technology become the norm in the near future? Let me know your thoughts in a comment below.